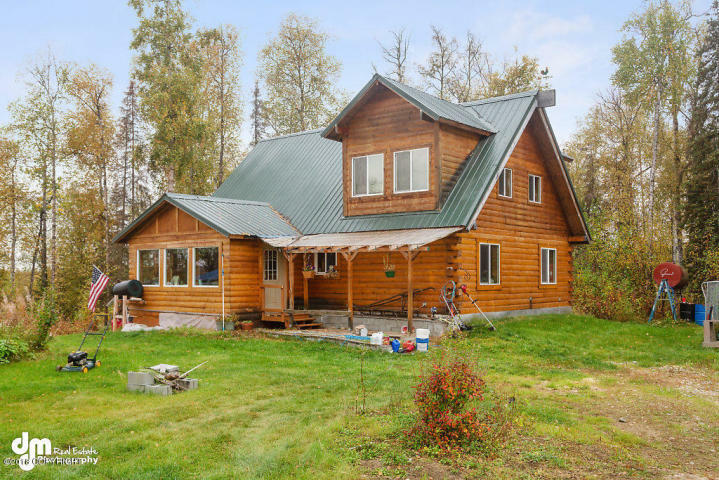 The Kristan Cole Team, member of The Kristan Cole Real Estate Network Just Listed a new Single-family home at 6245 S Sapphire Circle in Big Lake Alaska. Well constructed log home on over 3 acres of high ground with views! Overlooking Diamond Lake which is floatplane accessible. Cathedral ceilings with floor to ceiling windows create an open, airy feel. Wood floors and accents keep it light and bright. If you are looking for privacy, space and views all for an affordable price, this could be the one! Includes greenhouse, shed and chicken coop. The Kristan Cole Team is a member of The Kristan Cole Real Estate Network with Keller Williams Realty Alaska office with offices throughout the United States with future plans for worldwide office locations. For over 34 years Kristan Cole and her organization has served buyers and sellers with their real estate services. Currently with multiple locations including Arizona, Portland Oregon, Salt Lake City UT, Denver Colorado, Norther Colorado, St Paul Minnesota, Virginia, Massachusetts, Washington DC., and Orlando Florida. The goal is to provide unprecedented marketing strategies and PR services to provide exposure for their sellers as well as unmatched services to assist home buyers. Under her leadership her team has consistently ranked in the Top 100 in KW and Top 250 among all teams I n North America, as ranked by The Wall Street Journal and REAL Trends. In addition, Cole, now Vice President of Keller Williams Mega Agent Expansion, has also served as the Regional Director for Keller Williams Realty’s Southwest Region, a segment of the company representing more than twenty-five offices and thousands of agents. She also owns one of these offices, which has over 300 agents and three branch locations. Her other leadership opportunities have included serving as President of Alaska’s branch of the Commercial Real Estate Women (CREW) Network, Director of Keller Williams Realty’s Commercial Leadership Council, and Talent Search Director for Keller Williams Realty International's corporate headquarters. In order to ensure that every transaction that her team does benefits others, she has launched a non-profit organization called Kristan’s Home Of Hope, dedicated to supporting at-risk youth throughout the United States and beyond. Currently The Kristan Cole Real Estate Network sells a home every 11 hours.